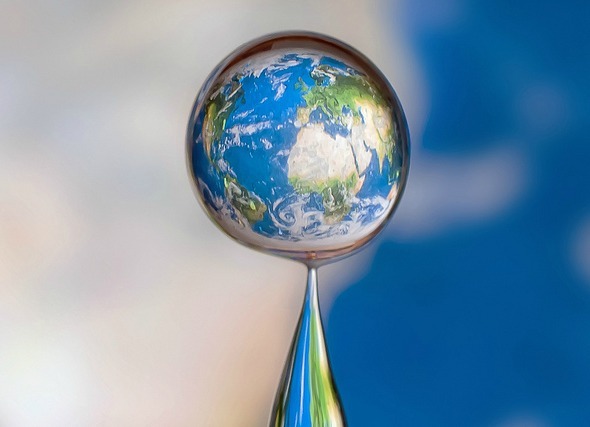 You probably already know that about 70% of the Earth’s surface is covered in water, but did you know you can make an entirely new one from just one drop? 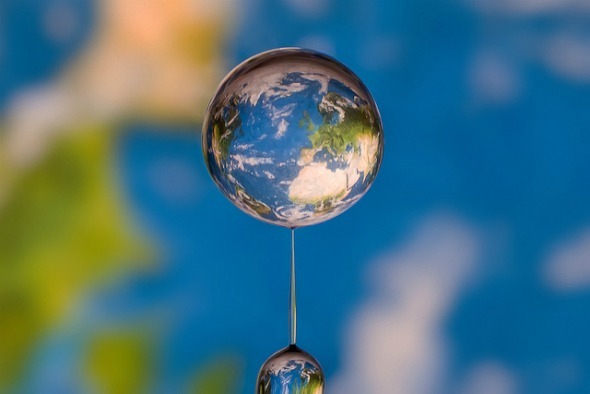 Ok, to be fair, it’s only an upside down reflection of the world as portrayed on a map, but, still, I doubt any of us has the talent or patience to recreate these brilliant photos by a photographer Markus Reugels. Even with all his experience shooting water drops, Reugels still takes hours to complete each shoot because no mater how much practice and talent you have under your belt, capturing a water drop at the perfect moment still relies on luck more than anything else. 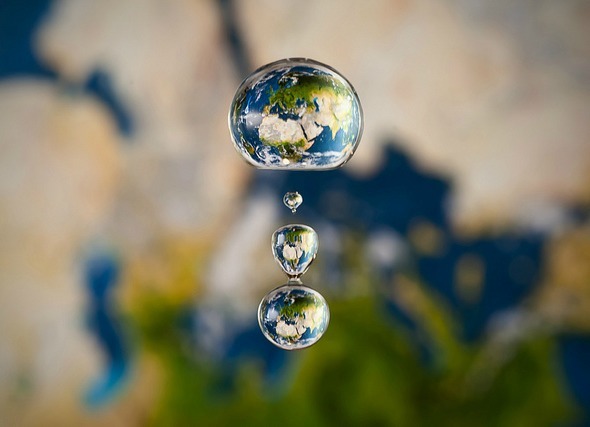 Fortunately, with a lot of time on his hand, a little luck and a world map, a simple photograph of a water droplet can easily become something more – easily taking on a deeper meaning, even preaching the importance of clean water to the health of our planet. 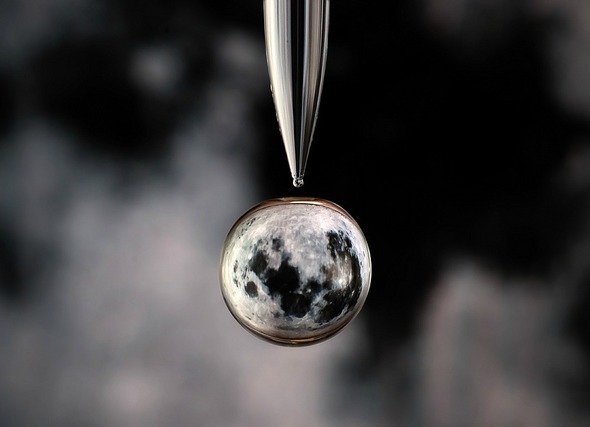 In Reugels workshop, even the moon, an object that we see on a regular basis, can suddenly become crystal-clear and even more stunning than it is while hovering above the night sky. Of course, Reugels didn’t start off shooting water drops. He was originally a family portrait photographer, but three years ago he decided he wanted to try his hand at something more challenging -something he certainly managed well. As for how he does it, well, his set up is actually quite similar (albeit much more professional) to the photographer who created the M.C. Escher water drop image last year. 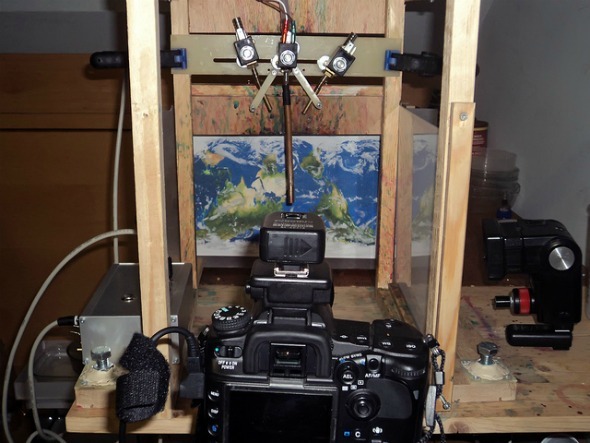 With a handmade wooden rig that both holds the water dropper and the backdrop that will show up in the droplet, Reugels stands behind his camera, poised to get the perfect shot -even after multiple failures. “There are so many factors who will influence the result – the viscosity of the water ,the height of the drops, the nozzle size even the temperature of the water,” he says. As someone with little patience, I highly commend this wonderful photographer, not only for his ingenuity, but for the dedication it takes to shoot something that requires such precision. Mr. Reugels, my hat goes off to you. Amazing! It must have taken him a long time to complete all these. But his political map is missing South Sudan. So you blame him for liquid political boundaries in an area of the world where they change weekly? how is this an illsion? How do you spell illusion? 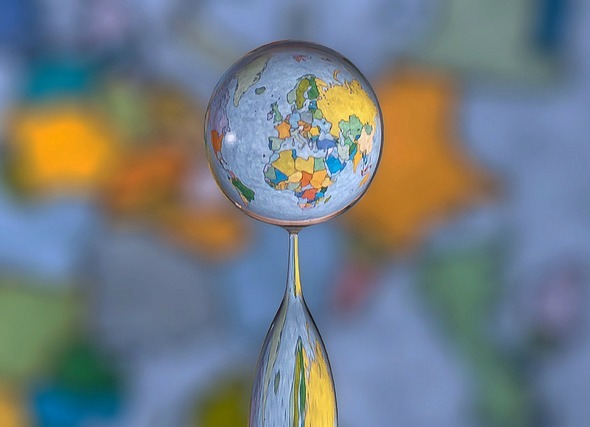 Because its not a real globe; just a water droplet. He has more patience than I do. His work is so beautiful. Wow! That is very creative! It must have taken them a long time to do!! Refraction, not reflection. Very nice images though! this is beautiful!! Is it possible that you would email me this photo so I can save & share it? AMAZING! just imagine the patience it must of taken to set this up. I think these are some of the most creative, beautiful pic., I’ve seen, I saved them to my cell & use them for the lock screen, I’ve also shared them in a few different spots., I saw a similar pic with a water drop infront of a flower & live that too, but my favourite are yours, such a great idea utilizing water like that, very impressive. I can’t seem to get your contact info from here. Send me an e-mail and I’ll get that picture to you.